A local councillor said parents need to take more responsibility for their children as a group of youths continues to cause nightly mayhem in the area. THREE GARDAÍ HAVE been injured in Cherry Orchard, Dublin, in two separate incidents over the last two nights. A garda spokesperson confirmed to TheJournal.ie that one officer sustained an eye injury on Tuesday night when a large group of youths attacked a garda van. In another incident last night, a stolen vehicle rammed a patrol car head on. The two gardaí in the car sustained minor injuries. Both of these incidents occurred on the same stretch of road, on Cherry Orchard Avenue – an area gardaí say they frequently run into trouble with a small group of troublemakers. One source described it as a “no-go area” for gardaí. “Every Halloween they try to entice guards in – there are lots of cul de sacs and you can be easily sealed off in it,” they said. 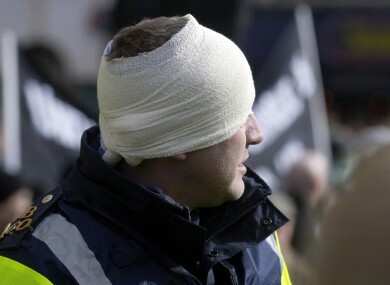 It is estimated that more than 1,000 gardaí in a force of 13,000 are injured every year. The number of assaults has increased in recent years and is now averaging three per day. That is not acceptable. The GRA has repeatedly called for increased protection for members and harsher sentencing for offenders. Independent councillor in the area, Vincent Jackson, witnessed last night’s incident and said he thinks it is “evident that a group of youths are almost putting it up to the community and to the guards”. This issue can’t prevail and I have to be brutally honest here, there are lots of interventions, lots of facilities in Cherry Orchard and Ballyfermot – things that cost multiple millions of euro. There’s a leisure centre five minutes up the road from there that cost €25 million and it only opened in 2010 and that opens until 10pm every night. He said local residents express concern about this anti-social behaviour at every community meeting he attends. Garda sources familiar with the area said this is just a small group creating issues as the vast majority of the residents do not cause trouble and are respectful to gardaí. “These people in the wider community are the salt of the earth and it’s just amazing how two dozen youths can create such mayhem,” Jackson said. The councillor said he believes parents need to take more responsibility, pointing out that when children aged 11 or younger are out on the street until 11pm “someone is not doing their job”. Email “Three gardaí injured over last two nights in Dublin 'no-go area'”. Feedback on “Three gardaí injured over last two nights in Dublin 'no-go area'”.